Taylor Ellwood has written some of the most innovative and firmly modern (in the best sense) books on magical practice available in the last decade. This particular monograph is in some ways a follow-up volume to his earlier Pop Culture Magic (though both Space/Time Magic and Inner Alchemy are broadly in the same sort of vein), and in fact one chapter of Multi-Media Magic is a specific response to some of the critiques of that earlier volume. However, reading the earlier volume is not utterly necessary to achieving a full understanding of this book — it certainly wouldn’t hurt, but it is not a prerequisite. Most people are aware that the term “multi-media” is the use of several different types of sensory input in a particular context for consumption — a PowerPoint presentation with images and music, a theatrical performance that has a film or video screening as part of the show, an interactive art exhibit utilizing performance as well as static visual materials, and so forth. If one is familiar with Ellwood’s earlier work, one would assume that the present volume simply offers a variety of further possibilities of using pop cultural materials — including music, comics, video games, action figures, and other such media — in one’s magical practices. While this is certainly true, one of the strongest points of this book is that it gives an excellent theoretical basis for the entire possibility of using and selecting any media for employment in magical practice. To summarize this basis rather simply, Ellwood points out that everything — including language and thought — is mediated, which is to say, it is not the “thing itself,” but instead is one’s perception and interpretation of phenomena. Any image which one can use to represent something else, whether in abstract symbolism, or in definite allegorical, mythic, or ceremonial usage, is mediated. Therefore, to use any medium beyond “pure experience” (whatever that might be!) is to employ media. Media is not simply the plural of “medium” in the sense of possible materials or styles in which to do art (e.g. sculpture, painting, poetry, music), nor is it simply the productions of various news organizations in print, electronic, radio, and televised formats, but instead potentially anything and everything. As a result, the implications of this book are far greater than simply spicing up one’s rituals with use of video games, creative arts, and computers. Ellwood does not go as far as saying that “the medium is the message,” but this book and the use of the practices described in it does presuppose that media can be used, and that there are specific messages involved in doing so that should be in accord with the will of the magical practitioner employing them. The book has a short Foreword by the author, followed by a brief introduction by Vince Stevens (a frequent contributor to Megalithica anthologies), and then four chapters dealing primarily with establishing basic understandings of both media, multi-modality, and magic, of which chapters three and four are devoted to discussions — academic and practical — of the latter, both in positive and negative evaluations. Ellwood repeatedly emphasizes how definitions themselves (as, and like, all media) are contingent, and are not the thing defined, and it is therefore essential for everyone to interrogate their own definitions of certain important terms, and either find one that works well for them, or develop such a definition themselves. Chapter Five is an answer to some of the critiques on Pop Culture Magic — a great deal of which simply comes down to differences in taste and preference by the vocal critics — as well as addressing the issue of how intent and meaning-making as well as being affected by one’s environment are equally important factors to take heed of for practicing magicians. 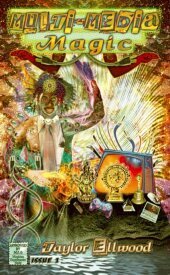 Three chapters follow on evocation, then two on invocation; and before the short conclusion, a trio of chapters on clothing, astral work and astral marriages, and banishing by detachment round out the main chapters. Six appendices follow, on a range of topics. The first is on roads and sidewalks as ley lines (building on some ideas from Christopher Penczak’s 2001 book City Magick), and possible ways to use them (including a particularly useful entity creation Ellwood did for avoidance of traffic police). The second is on citation in works on paganism and magic as a magical practice of its own — an intriguing and indeed enchanting notion, particularly for those who enjoy footnotes and proper crediting of ideas as both methodological and ethical concerns. The third is on push-pin and thumb-tack sigils — though I think that use of cork boards probably should have been mentioned here (particularly for the benefit of those of us who don’t own the walls in which we reside! ), and for that matter, dry erase boards or even chalk boards might easily be adapted to some of these same purposes. The fourth is on feasting with pop culture entities (but could work equally well with any noncorporeal being — indeed, the theoxenia is a standard practice for many Hellenic reconstructionists), and the fifth on use of the website Seventh Sanctum for entity creation and magic. Of the various appendices, this fifth one was the least useful, and probably could have been omitted without much loss. The sixth and final appendix is on the danger of solipsism in magical practice, and is probably one of the most useful sections of the book in general; far too much attention is often paid to intent rather than to results and impact, and Ellwood addresses this responsibly and in a very articulate fashion. The bibliography is eight pages long, and complete as far as I was able to tell, though some editing and formatting omissions (e.g. titles not italicized, etc.) occasionally crop up. The half-page index on p. 251 is not very useful at all, and only contains thirteen (extremely general) terms, including things like “Pop Culture” and “Ritual,” each of which have three lines of page numbers following them. “Passim” would have been more useful to use in those (and many other) cases, while referencing things like particular authors and occult figures mentioned and discussed often (e.g. Tanya Luhrmann, Austin Osman Spare), pop culture figures (e.g. Bugs Bunny, Sephiroth), deities, and the like would have been far more useful. Overall, the editing is pretty good, though there are some lapses here and there (but none are a barrier to comprehension). A reference on page 162 to some work from 2002 was not clearly comprehensible to me. One particular stylistic choice seemed odd for this reader: footnotes were continuously numbered throughout the book (and since there were only 58, that’s certainly acceptable) rather than the numbering re-starting with each chapter; but, they were usually given between the word and the punctuation, which is not a standard style in either American or British usage to the knowledge of the present reviewer. As Ellwood makes a point of mentioning that he was involved in academia for several years, this seemed an unusual and atypical choice that jarred me more often than not; it is found in some other Megalithica titles by Ellwood (though often not systematically), but I have not encountered it apart from that. If I were to choose one part of the book which particularly resonated with me, I would have to say that a discussion on page 93 (a Thelemite’s preferred page! ), on the importance of definitions, was especially noteworthy. “Relying on the knowledge of others doesn’t mean we’ve learned anything if we never question that knowledge or try and find our own way.” This is a point far too often under-emphasized, and sometimes not even recognized, in spirituality, religion, and magic practice. Individuals’ insights often come after great periods of trial and error, and may be encapsulated in brief statements, but those statements may not translate or (more appropriately to the present book) be mediated in a manner that makes them applicable or discernible to others. A great number of people simply are content with aping spiritual catch-phrases or toeing a particular line of expected belief in certain platitudes, rather than understanding them deeply or investigating them themselves, which leads to any number of renowned pseudo-gurus and cults of personality. This is an important point that Ellwood emphasizes and returns to on numerous occasions, but it is one that bears repetition: everything must be tested and refined in one’s personal engagement, and questioning of all processes and ideas is healthy and useful in coming up with the best possible solutions to one’s magical dilemmas. There are a few occasions in this book in which reductionistic thinking sometimes mars the argument. On p. 28, a reference is given to a self-published book by Stephen Mace on magic and politics to make the point that texts and tools can outlive their purposes, and insistence on them can hold back human progress, and “[t]he evidence of that in action is the repressive attitudes displayed towards scientific progression in the medieval era.” The matter of medieval science is a far too complex, and locally and temporally varied phenomenon, to make such a sweeping and dismissive statement. A few statements about Christianity on pages 56 and 84 likewise seem to favor reductionism rather than nuance, and not always to the furtherance of the point being made. On page 197, dualistic elements in religions are mentioned, and Norse cosmology, with ”Valhalla and Hel,” lumped in with other more obvious examples of this in possible afterlives, which is certainly not doing full justice to the Norse situation as it is currently known. The example of “Loki and Coyote” as “trickster” figures is reused so often as to become a stock phrase — surely there are other possibilities? The “alphabet of desire” (often abbreviated “AOD”) is also mentioned at various points, and while the concept does originate with Austin Osman Spare’s Book of Pleasure, the phrase itself comes from Kenneth Grant’s 1974 introduction to that work, which is an important matter to note. On page 82, Ellwood laments the lack of academic engagement with magic, and the limitations of academic examinations since they are not by practitioners, but his review of the published literature on this matter is nowhere near comprehensive, and I would in particular wonder if he’s aware of the work of Ioan P. Couliano, who was an academic, a fiction writer, and someone who advocated understanding magic by practicing it. I would also note that several chapters (7, 9, 11-13) and one appendix (1) are reprints of earlier works, with revisions, of earlier articles published by Ellwood, often even earlier than or contemporary with the original publication of Pop Culture Magic in 2004. In his introductory chapter, Ellwood notes this, and that some of the later chapters after the first five might not seem to have much in common with the earlier ones, or seem relevant. While I do agree that there are worthwhile things in those various reprinted chapters, and they do not seem discontinuous with the remainder of the book’s materials and subject matter, the last half of the book does seem in parts a bit more like an auto-anthology than a carrying through of a particular set of theoretical principles and an overall programmed argument on a certain topic, which most monographs that are billed as such should be. Ellwood has proven in the early part of his book (and, indeed, in his other works) that he is capable of such an argument, and so I somewhat wonder if these further chapters were inserted to simply pad out the book, when a shorter and more topical treatment might have worked equally well — the first five chapters could almost stand on their own as an excellent theoretical text, and there is nothing wrong with a more brief and more concentrated excursus. The shorter articles are stated to have been revised, but creating an overarching theme in the book and a greater unity between parts could probably have been done more effectively than stating, in effect, that all of these things really do go together, at the beginning and the end of one’s discussion. As anything potentially has relevance to the theoretical premise upon which Ellwood has based this work, the same is probably true of any previous writings he may have written; but nonetheless, the issue was not one of subject matter relevance, nor of the value of the materials included, but instead of a feeling of stylistic and rhetorical continuity, which didn’t always feel present. Despite any critiques I have mentioned above, I would highly recommend this book — indeed, if anyone came away from reading this book with wholesale acceptance and nothing to add or subtract, I would highly suspect the person with such an opinion missed the point entirely! Ellwood continues to produce excellent new work, as well as revisions of his earlier works, and has been very open to critique and the possibility of further refinement of his writing, and certainly of his theories and practices, which is quite an ideal modus operandi for anyone working in such a cutting-edge magical paradigm. On its own, or in concert with any of his other publications, Ellwood’s Multi-Media Magic cannot help but to stimulate and encourage one’s own practical engagement, experimentation, and expansion in the realm of one’s possibilities within magical work.